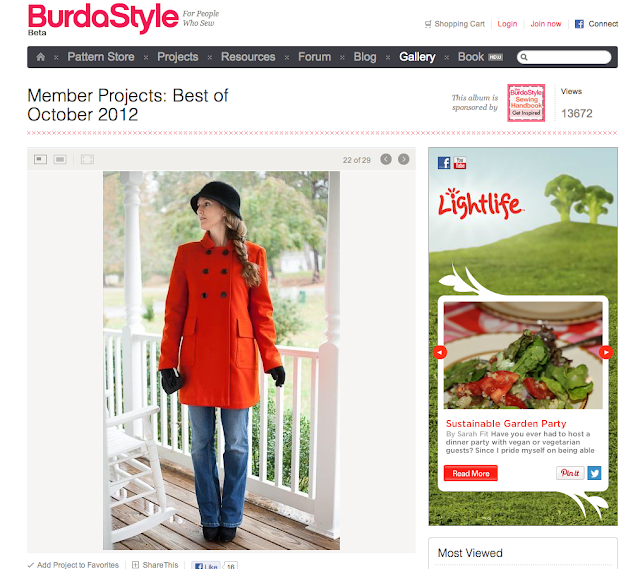 The best of October slideshow is up on BurdaStyle today. My Stroll in Autumn orange coat is part of the slideshow. Come check out the other member projects that were selected for this months slideshow by clicking HERE. This morning I woke to a frosty world outside. My entire property looked as though someone had sprinkled it with a gentle dusting of powdered sugar! Soon it will be time to pull out the Christmas decor, and start my Christmas shopping! We need to clean up our boat and put her to bed for the winter as well. We were hoping to get another warm day in out on the sandbar before we prepped her for winter, but I doubt that will happen now. Oh well! I guess we have to wait until spring now. That is ok though…I will use this time now to think about all the sundresses and cute summer outfits I will make to wear. I will also use the time to train, and get into tip-top shape for the swimsuit/boating season. I need to get back to my sewing machine!